The highest ranking member in Tasha's base, he is a ghost summoning shaman and is worth 2 S-Class. His attacks are invisible and inescapable. He looks over Tasha per Edea's request and gives Elma her supporter. One of his ghosts, Bari, is his assistant and can fire laser beams and wield a sword capable of keeping up with Surtr and not any of the A-Class WH can touch her. 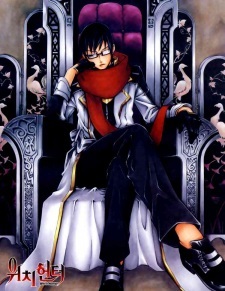 He is currently fighting East since she appears only around Tasha and plans to use him until he disappears or dies. He can scan souls, bypassing Magical barriers. He surpassed Surtr in strength until East supplied him with Mana. Shamanism: He summons the spirits of Ghost to fight Chant: "Come to life"
Destruction: He fires a laser that managed to nearly kill Surtr.